Many group admins use the Facebook group questions as part of their group member approvals process. Savvy marketers are using the feature to build their email list by inviting group joiners to respond to a question with their email address if they’d like to receive the admin’s lead magnet. I’ll talk more about this in just a moment, but first, let’s talk about the difficulty with collecting email addresses in group questions. When your group joiners are typing their question responses into Facebook, they aren’t entering them into your CRM. You, somehow, need to ‘scrape’ the responses from Facebook if you want to see them all in one place, or upload the email address into your CRM. And this needs to be done BEFORE you click the button to approve the join request. Once you’ve accepted their request to join your group, you can’t access their question responses anywhere. Basically, the only way to extract the responses at all is to manually copy and paste each one into a spreadsheet. Recently I discovered Group Funnels. Group Funnels is a paid Chrome Extension that automatically sends the users’ information and all responses to your questions to a Google spreadsheet, and creates a downloadable csv file. It’s accessed via the Chrome browser on either a PC or Mac. 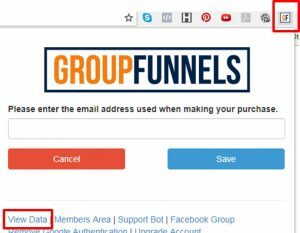 #1: Purchase the Group Funnels Chrome Extension, activate it from the extensions area, and enter the info requested to validate your purchase. #2: Create a Google Sheet – one per group – and enter the sheet’s share link where directed in the specific group. #3: If you haven’t already created your group questions, head to the group’s settings area and set them up now. #4: Promote your group, inviting new members to join. They will automatically see the questions when they click the ‘request to join’ button. #5: When you next go to your group to approve the join requests, you should see this green bar showing you that Group Funnels is ready to use. #6: This step is optional, but I keep a record of the numbers each day for my clients so I can track the % who answer the question/s and provide their email address. If you want to do the same, first make a note of how many join requests there are, then filter the requests for ‘Answered Questions’ and keep a note of that number too. #7: After checking that Group Funnels is ready, click on ‘Approve All’. #8: A pop will appear showing you the counter of members being approved. When it has finished approving, the pop up will close and you’ll be taken back to the requests screen. #10: You’ll see a drop-down menu that currently shows as ‘All Groups’. Click on the drop down and select your group from the list. #11: Click on the ‘Download as CSV’ button to download a csv file of all the questions and answers. Save the file. #12: Next, click on ‘Push to Google Sheet’. This will send the same data to your Google Sheet – your master data file. #13: Finally, return to the Group Funnels data tab in Chrome, and ‘Clear Data’ so you don’t download the same data again next time. If your questions included an invite to provide an email address to receive your lead magnet, the next step is to add this data to your CRM. Group Funnels does connect to a few CRMs via Zapier, but I found it simpler to do it manually, and it’s the manual process that I will walk through here. #1: Open your csv file in Excel. #3: Next, insert 5 blank columns to the right of the name column. 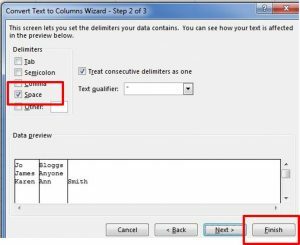 You insert columns because the next step is to separate the single column containing the first and last name into two separate columns – one for first name, one for last name. Some people may have double-barrelled surnames or have included their middle name in their Facebook name and when you do the separation, you need a separate empty column available for each name, so as not to overwrite the data in the email address column. You’ll see in the image above, I added another entry with three names, to show you what happens in this scenario. #4: Highlight the entire column containing the name. 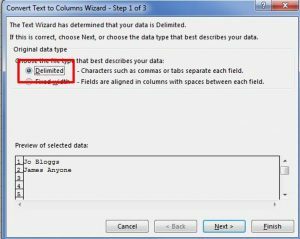 #5: Go to the ‘Data’ tab of Excel, and select ‘Text to Columns’. #7: Select ‘Space’ on the next screen. #9: Now you’ll see you have 2-3+ columns of names. Karen’s name now occupies 3 columns. Look down your list, and for any entries where you have more than two columns of names, edit these to add the extra name where it belongs, in either the first or last name column. (E.g. I’d edit Karen’s first name to ‘Karen Ann‘. #10: Delete all the empty columns, and you now have a csv file containing 3 columns. Change the header row column names to, ‘first name’, ‘last name’, and ’email address’. #11: If you’re keeping a note of your daily numbers, then count up the number of email address you have in your .csv file, and make a note of this number too. #11: Save this file in csv format, using a different name or in an alternative folder so as not to overwrite the original file. #12: Open your CRM, and using their ‘Import Data’ feature, upload your edited csv file and match the data fields. #13: Then once the data is uploaded, trigger the campaign or email that delivers your lead magnet. There is another benefit of using Group Funnels to download the responses to your group questions. The data you download includes the Facebook User ID for each person. To be able to advertise to the people whose data you upload to Facebook, the data you upload has to match with the data Facebook holds. If you have ever uploaded a csv file of your CRM data to Facebook as a Custom Audience, you will know that the ‘match rate‘ is usually only around the 40% mark. If your CRM only holds names and email addresses, the email address you upload must be the same email address that is used to log into Facebook or you won’t be able to advertise to that person. However, uploading your list of User IDs will achieve a 100% match because it’s data that Facebook already uses to identify each of us. So, periodically, download your Google Sheet as a csv file, edit to remove all columns except the column showing the User ID, and upload the file to a Facebook Custom Audience. And you’ll be able to run Facebook ads to your group members. I want to leave you with an idea of how you could apply what I’ve covered here into your own business. Let’s start with your Facebook group. I’m going to assume that you are a leader of a Facebook group that delivers a specific outcome, to a specific group of people and that you have clear conversion goals. E.g. you are a ‘Career Confidence Coach’ with a group that people join for guidance on increasing their career confidence, and that ultimately, they can buy your programs or work with you to increase their career confidence. Your Facebook group could either be Public (open), Closed, or Secret. When the group is Public, members AND non-members can see all posts, but non-members have to join the group to comment. Closed groups show up in Facebook searches, but non-members can only see who the members are, they cannot see posts until the join the group. Secret groups don’t show up in searches, only members can see the group and add new members. To build an email community using the group questions and Group Funnels, set up your group as CLOSED. When the group is public/open, there is little incentive to join. Most members of any group (80/20) are lurkers, only ever reading posts and rarely, if ever, commenting. When the group is open, everyone can read the group posts so lurkers have their needs met without joining. Your lead magnet must be RELEVANT to the MAJORITY of your audience. Someone who is experiencing a loss of confidence at work will be motivated to join the Career Confidence Coach’s niche group. They will recognise its relevance to them. And when your lead magnet is equally niched and relevant, e.g. “10 Instant Career Confidence Boosts” the majority of group joiners will be eager to receive it. Over a 90-day period in another one of my client’s niched groups, 70% of group joiners (mostly people who did not know of her previously) answered at least one of the group questions. 70% of those provided their email address to receive her lead magnet – roughly a 50% conversion rate for new group joiners opting in to her email community. Considering that 90%+ of the people requesting to join the group were cold – in other words, seeing the promotion for the group was the first time they had heard of my client – that’s a very good conversion rate. Coming back to as the ‘Career Confidence Coach‘ again, you’ve created a WOW experience inside your group and added a ton of value with your awesome content. Next step is to invite those who are ready to invest in working with you to ‘increase their career confidence’. Facebook’s algorithm applies inside groups too, so not every group member (or you!) will see every post in the group. Don’t rely on posting alone to reach group members with your paid offer. This is where your list of User IDs comes in. Having uploaded your data to Facebook, you can run a Facebook ads campaign to your group members promoting your paid offer. If you use Facebook to promote your coaching, training, consultancy, mentoring, therapy, services-based or expert business, think about how YOU can use Group Funnels inside a Facebook group to build YOUR highly-engaged audience too.